We have this space at the bottom of our stairs - it isn't really a room, just an open space on the way to the family room. I have pondered and tried a few things with the space over the past 4 years, but haven't really come up with anything I liked. Recently I came across this idea and decided I should turn the space into a library of sorts. Now I am so pleased with this space and my girls love it, too. It's just so inviting to grab a book and cozy up for a bit. Another plus is that the books are no longer getting left all over the floor because the books are so easy to browse through and even easier to put back. Yes, even my 2 year old can put the books back now and it looks as neat as it was before she started. It was such an inexpensive project and so easy to do that I put it up all by myself when the hubby was out of town. I bought some vinyl raingutters, brackets, and endcaps and then cut them to the size I wanted. I changed my mind on the bottom piece and ended up not cutting it at all. I just hung the entire 10 foot piece. The other pieces were quite easy to saw through with a hack saw. This project only took about 45 minutes from start to finish. This doesn't hold all the books we have, but I am going to rotate the books a bit so that something always seem new and appealing - an idea from Art for Little Hands. And see that comfy looking beanbag in the corner? That's new, too. I bought an inexpensive shell and filled it up with some of the kids' stuffed animals. We have a TON of stuffed animals. I am thinking this will be a great way to store them and rotate them as well. Now that this space has a purpose, I want to add some of these raingutter shelves to each of the girls' rooms as well. We do the same thing with our stuffed animals. We have far too many and I bough a spider shaped bean bag at Ikea and stuffed it with the animals. I wanted to do the rain gutter book shelves. I did it with an ikea shelf and it fell down the other day. I wish I had a larger area and that our walls weren't plaster so things would stay hung. I love this reading area. 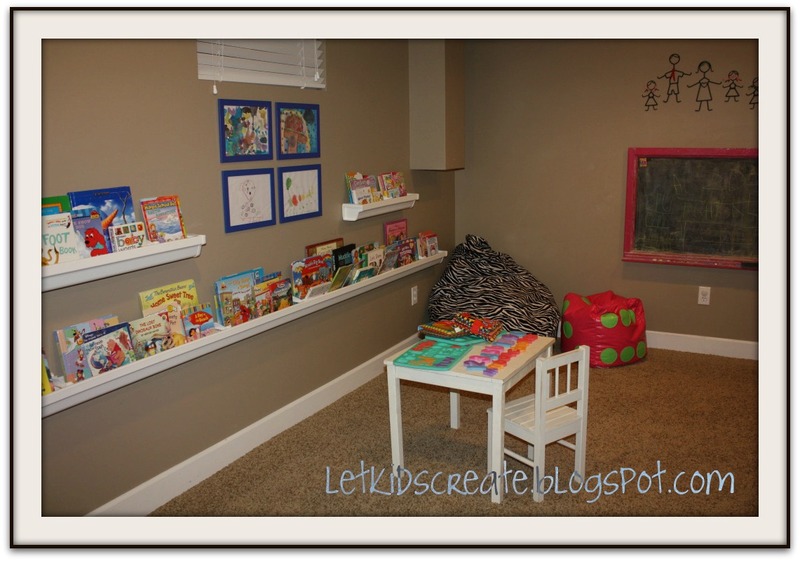 I love this idea, I actually saw this on blog land about a year ago and thought about doing it in our play room, but never did! I love it! What a great idea! I love the forward facing bookshelves. We're moving next year and will have a dedicated playroom for my son. I will use this for inspiration! Thanks! Love it - it looks so inviting - the way books are presented really makes a difference to how kids use them don't you think. Well done! What a cozy, inviting reading space! 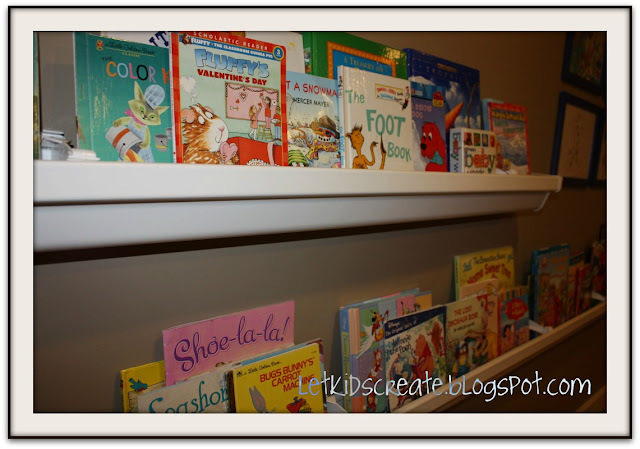 I really like those shelves - my younger two boys leave books out constantly because it's difficult to put them away on a regular bookshelf. We need to try this! I've been wanting to do this as well! Yours turned out great! I love that you did it yourself too. I've really enjoyed reading your blog. Thanks! That bean bag idea is crazy smart. And the book shelves are gorgeous- very form follows function- Love it! fabulous - i would love a space lie hat! I adore this space! Where did you get the bean bag cover? Britney, the bean bag cover came from Smith's Marketplace. I'm sure you can find them at Walmart or Target though.